Continuing from where the last episode left off Armin, Reiner and Jean are left with only one horse as the female titan heads towards Eren. They’re rescued by Christa who has several horses with her. Much like the previous episode the “Female Titan” was the highlight of this episode. The Female Titan engages in battle with four soldiers. They attempt to attack simultaneously expecting that even an intelligent Titan couldn’t counter. She jumps crushing two of the soldiers. The most jarring kill comes when she kills the third solider by spinning him by his wire. The fourth solider attempts to escape to no avail she quickly kills him. Who ever this Titan is her cruelty seems to give her great pleasure. The female titan maintains her chase as Eren under the command of Levi head into the forest. As the Female titan gains on Eren’s group they are ordered to draw their weapons. The female titan continues her brutal massacre of the soliders smashing one into a tree. At the end Levi seems to have a plan as he shoots into the air. 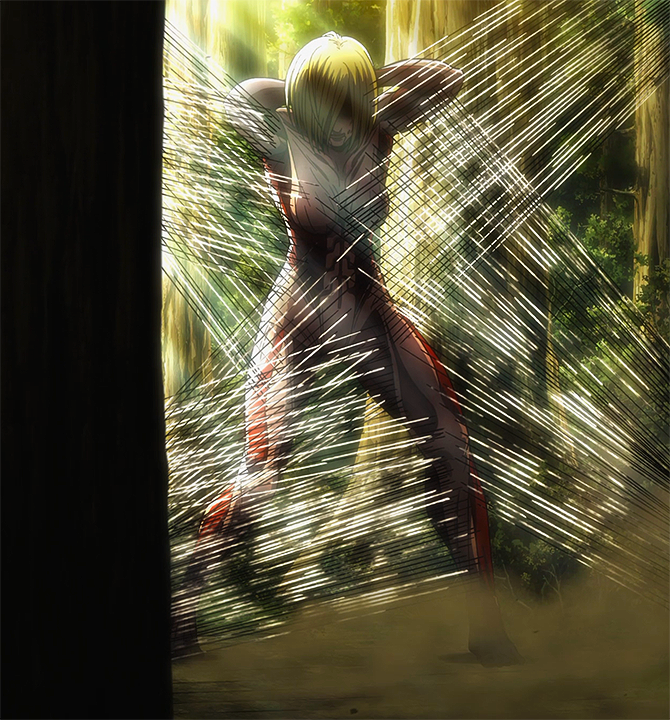 This episode featured less action than the previous two, however some light was shed on how Titans (Eren) transforms. Eren begins to questioning Levi decision or lack there off. Eren struggles weather he should transform or not. A flash back is triggered, Eren remembers his previous time with Levi’s squad. Levi clams to have figured a way to stop Eren without killing him. Hanji takes center stage in this episode. I like her as a character she fitting the mad scientist archetype well. Hanji manages to be funny and a little scary at the same time. She gets permission to do experiment with or on Eren, but he seems willing. Her first experiment is to have Eren transform in a dried up well. However, this experiment completely fails leaving Eren with a series of bloody bite marks. Later Eren drops a teaspoon when he touches it he instantly transforms. Hanji while ecstatic notices that the titan armed that formed was holding the teaspoon. Hanji concludes that “Eren must have a clear goal in mind, as he always had each time he transformed”. Back in the present Eren finally decides trust his squad, at this moment the Female titan begins to accelerate. Irvin gives a command and she is trapped. While this episode didn’t feature a great deal of action it did add initrigued to the story. So do you think Hanji is correct? What do you think of Hanji as a character? Who do you think the Female Titan is? Next Post Sakuga Animation: What is it and Why I love it. This was a great run of episodes for Attack on Titan. I was so excited throughout each episode that I was yelling and groaning with every kill from the female titan and urging Eren to get the hell out of danger! When Erwin sprung the trap I was so relieved. As far as Hanji goes, she’s right. Through her and Armin, the world of Attack on Titan will be explained. She’s a great character because she’s unique. While most are serious and can only see the negatives of their situation and titans, she brings about a new line of thinking through her fanatical desire for knowledge and she adds humour. I won’t give away who the Titan is and I’m avoiding YouTube/other anibloggers to make sure I don’t figure out who the other ones are. I agree that Attack on Titan has been extremely exciting. Hanji is quickly becoming one of my favorite characters. She’s definitely the anime comic relief. Like you I am avoiding potential spoilers on the internet.